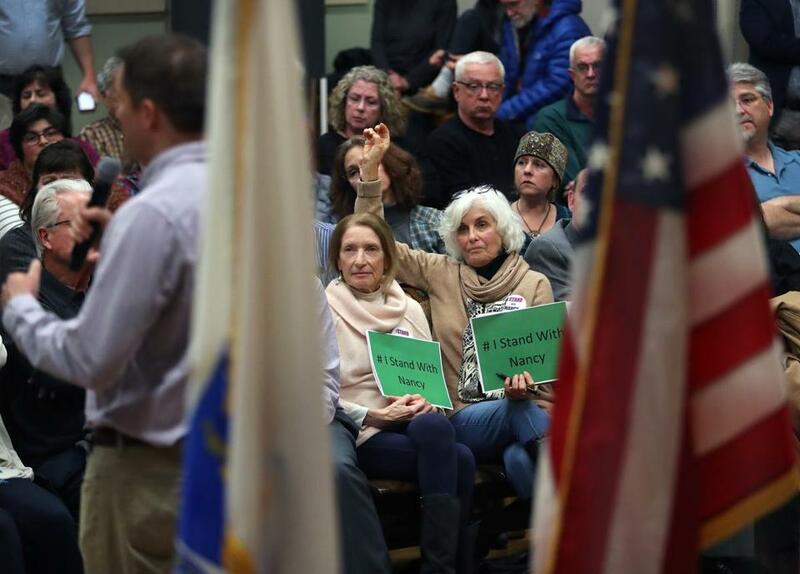 Some at US Representative Seth Moulton’s town hall-style meeting in Amesbury Monday held signs backing Nancy Pelosi. WASHINGTON — The day after Democrats’ cataclysmic defeat in 2016, Nancy Pelosi and other House leaders attempted to buck up their demoralized troops with some words of comfort. The longtime Democratic leader told the lawmakers on a conference call that losing the White House to Donald Trump and failing to win the Senate was disappointing, but at least they could take heart in the fact that they had picked up a handful of seats in the House. While many saw this as a harmless attempt to lift spirits, at least one Democrat on the line, Representative Seth Moulton of Salem, was fuming. “They were essentially patting themselves on the back,” he recalled. He believed Pelosi was dodging responsibility for her part in the disastrous results. It’s that moment that turned Moulton from a fairly docile member of the Democratic caucus to a full-throated Pelosi critic, he says — a stance that has helped build the relative House newcomer a national reputation as an independent-minded truth-teller. 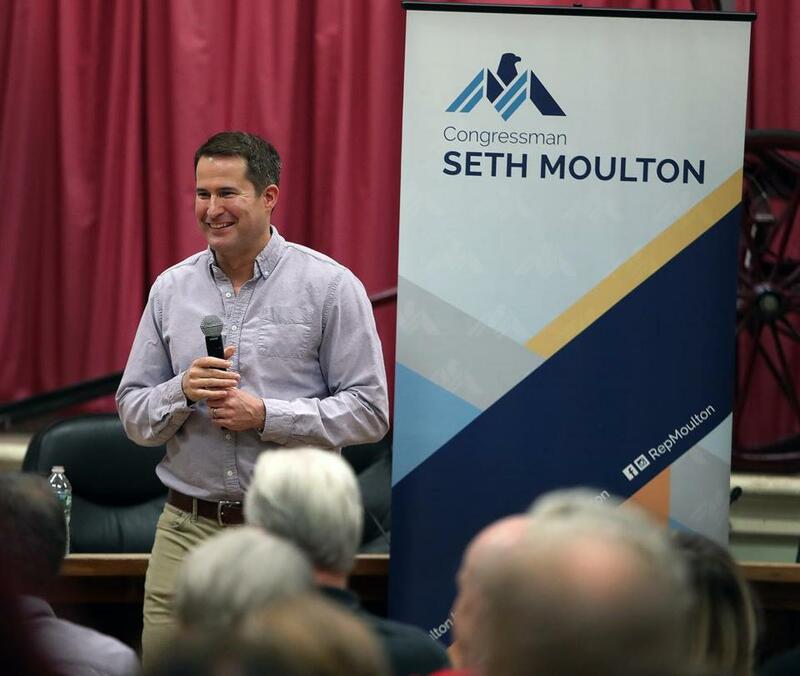 Moulton raised his profile even more by founding a political action committee that recruited and funded veterans running for office, many of whom ran on his same message of change and shaking up leadership. But now, with Democrats in the majority in the House and the stakes much higher, Moulton’s quest to oust Pelosi and her top lieutenants in favor of an unspecified “new generation of leadership” is being seen in a less flattering light both in Washington and back home. National progressives argue he is validating right-wing talking points against Pelosi, while fired-up liberal activists reprimanded him in a town hall in Amesbury on Monday for dividing the party when they should be focusing on ousting Trump in 2020. Republicans, still smarting from their electoral losses, are enjoying the moment. “For those asking, Moulton is NOT on our payroll,” joked Republican National Committee spokesman Matt Gorman on Twitter last week. After Democrats decisively took back the House earlier this month, even Donald Trump assumed Pelosi would become the next speaker, congratulating her in his post-mortem press conference. Moulton had other ideas. He enthusiastically stepped into the role of helping lead the Pelosi rebellion in the Capitol, encouraging colleagues to challenge her, collecting signatures on a letter opposing her, and making his case on cable news for why the leadership needs to go. The letter, released Monday, calls Pelosi a “historic” figure but shows 16 incoming and current Democrats will not vote for her on the House floor in January — enough to cause Pelosi a serious vote-counting headache. (One of the signatories, Ben McAdams, may still lose his race, bringing the total down to 15.) Pelosi needs 218 votes to become speaker, though that threshold can drop if some people vote “present” instead of “no.” Democrats will have at least 232 seats in the House, likely meaning only 14 Democrats can vote against her on the floor. Though her allies are confident she will pull it out, the tough math raises the spectre that Pelosi could lose a floor vote in January due to opposition from a small fraction of her caucus, leaving the party temporarily without a leader. Democrats vote next week behind closed doors on their leadership slate, and so far, no one is running against Pelosi, 78, or her deputies Steny Hoyer, 79, of Maryland, and Jim Clyburn, 78, of South Carolina. Representative Marcia Fudge of Ohio, whom Moulton counts as a mentor, has said she is considering challenging Pelosi, but hasn’t made up her mind. She removed her name from the letter before it was released, raising questions about what path she’ll take. Even if Pelosi wins the backing of her party behind closed doors, Moulton hopes to block her on the House floor in January, forcing her to step aside. Some of Moulton’s constituents were fine with his calling for new leadership generally, but they have turned against him now that he is threatening to take the fight to the House floor. Isa Leshko, who organized an effort to flood Moulton’s Monday town hall with pro-Pelosi protesters, said she was “loving Seth Moulton” until recently. “The fact that he is dividing us at a time when we have this resounding blue wave, I just can’t support him,” she said. At the sometimes heated town hall, Moulton addressed concerns that he was opposing Pelosi because she was a woman, saying he also favored Joe Biden over Hillary Clinton for the presidential nomination in 2016 but he didn’t believe that made him sexist. Some are suggesting he is taking the stand only to position himself for a Senate run or other higher office. Moulton is taken aback at the reaction. He also argues that he hasn’t focused exclusively on Pelosi, as his critics allege, pointing out that he is one of a minority of Democrats not backing Hoyer for his reelection. “I’m for a new generation of leadership across the board,” he said. Moulton’s rhetoric on Pelosi hasn’t changed, but the mood in Washington has. When the young congressman started criticizing Pelosi two years ago she had just presided over her fourth straight electoral loss for House Democrats, who had been shut out of power in the House since 2010. Younger members of Congress were grumbling privately about Pelosi and her top deputies’ iron grip on power, and Moulton was doing them a favor by airing that criticism publicly. But now, the party — and Pelosi — is flying high after flipping more than 35 seats with a younger and more diverse slate of candidates, and the ground has shifted underneath Moulton’s feet. The main criticism of Pelosi — that she’s unpopular nationwide and thus a drag on the Democratic ticket — has become moot with these victories under her belt. Moulton points out that many of those new lawmakers won in part by promising to shake up leadership in Washington, with some even explicitly vowing not to vote for Pelosi under any circumstances. Approving the same slate of leaders the party has had since 2006 could curse them later on in their districts. But even some of the candidates Moulton endorsed and funded through his Serve America PAC are uncomfortable with his approach. Pelosi’s team says they believe she will win the day in January. She has already made some headway lobbying new members who promised not to vote for her, like Mikie Sherrill of New Jersey, who has gone quiet on her Pelosi opposition in recent days. “Leader Pelosi remains confident in her support among members and members-elect,” Pelosi spokesman Drew Hammill said in a statement. Globe correspondent Jackson Cote contributed to this report. Liz Goodwin can be reached at elizabeth.goodwin@globe.com.